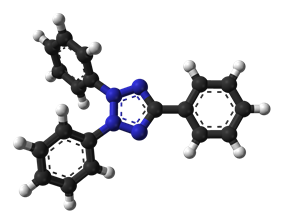 Triphenyl tetrazolium chloride, TTC, or simply tetrazolium chloride (with the formula 2,3,5-triphenyl-2H-tetrazolium chloride) is a redox indicator commonly used in biochemical experiments especially to indicate cellular respiration. It is a white crystalline powder, soluble in water, ethanol and acetone but insoluble in ether. In the TTC assay (also known as TTC test or tetrazolium test), TTC is used to differentiate between metabolically active and inactive tissues. The white compound is enzymatically reduced to red TPF (1,3,5-triphenylformazan) in living tissues due to the activity of various dehydrogenases (enzymes important in oxidation of organic compounds and thus cellular metabolism), while it remains as white TTC in areas of necrosis since these enzymes have been either denatured or degraded. For this reason, TTC has been employed in autopsy pathology to assist post-mortem identification of myocardial infarctions. Healthy viable heart muscle will stain deep red from the cardiac lactate dehydrogenase; while areas of potential infarctions will be more pale. Note: TTC is somewhat heat and light unstable, so avoid these environments as much as possible. ^ Witty M. (2012). Topographischer Nachweis der Keimfähigkeit der Getreidefrüchte durch Tetrazoliumsalze (Topographic Detection of Germination in Cereal Crops by Tetrazolium Salts) — A Translation of Lakon’s 1942 Paper on Tetrazolium Seed Testing. Seed Technology 34(2):275-282. ^ Witty M. (2012). The process for 2, 3, 5 - triphenyl – tetrazolium chloride synthesis, an intellectual property seized immediately after world war II. Bulletin for the History of Chemistry 37(2):91-95.